Indulge in a relaxing cup of tea with Twinings' Pumpkin Spice Chai Tea. 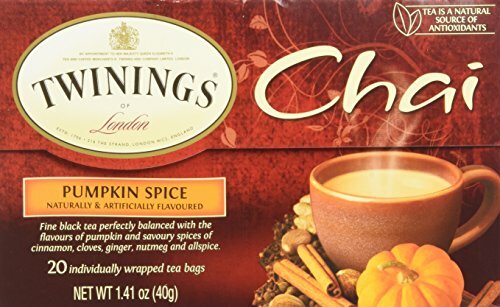 Since 1706, Twinings of London has been masterfully blending teas to create a special moment with each cup of Pumpkin Spice Chai tea you brew. This fine black tea is perfectly balanced with the flavors of pumpkin and savory spices of cinnamon, cloves, ginger, nutmeg and allspice. Each of the two boxes come packed with 20, standard sized tea bags, so you can brew your tea by the cup, or by the pot without any hassle.